I wonder how Betty’s pregnant friend feels about watching Betty parade her skinny body around in skimpy clothes. Even though Betty doesn’t usually opt for this kind of vibrant, revealing attire, I think this little dress is amazing on her. Betty looks like she’s about to lead a very patriotic cheerleading team to their first state victory. It seems like Betty is cleaning out her closet, and I think she should definitely keep this outfit. 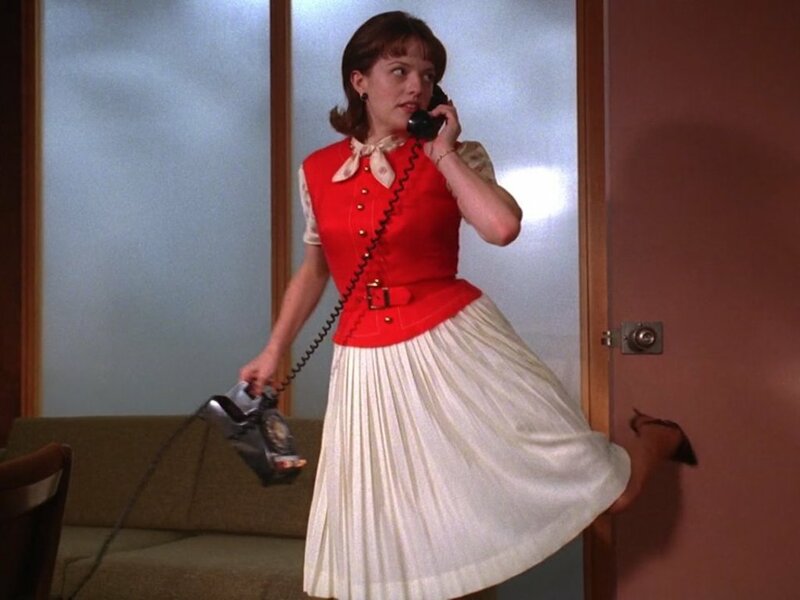 I don’t know how I feel about little innocent Sally Draper wearing a pair of stark white go-go boots. Still, this outfit is pretty epic. I feel like every little girl would love to wear something this sparkly. Sally kind of looks like a little version of Megan in this scene. I’m sure she was already taking style cues from Megan at this point in the show. The tiny matching clutch is everything. I don’t remember where Don and Megan were going in this scene, but it must have been somewhere extremely fancy. Don is in a full tuxedo and Megan looks like literal royalty. Megan loves to experiment with color, but this may be the boldest outfit that she wears on the show. It has everything— shine, color, texture, and pattern. It’s not my favorite look that Megan’s ever worn, but it certainly attracts a lot of attention. This looks is much simpler than the dress Megan was wearing in the previous slide. Of course, Megan is still a secretary in this scene, so she can’t yet afford all of the fancy attire she acquires when she becomes a successful actress and Don’s wife. I’m going to call this outfit dental hygienist chic. I love the color, I just don’t know if I love the color from head to toe. It looks like Joan took a hint from Megan and tried her own take on a monochromatic color palate. Joan went for purple on purple, and I think this color looks great with her bright red hair. I like that she’s painted her nails a bright red to match her lipstick and her fiery up-do. Joan looks amazing in just about anything, so it’s no surprise that this purple outfit is working for her. Sally looks like a traditional ’60s schoolgirl in this greyish khaki-ish pinafore and turtleneck combo. 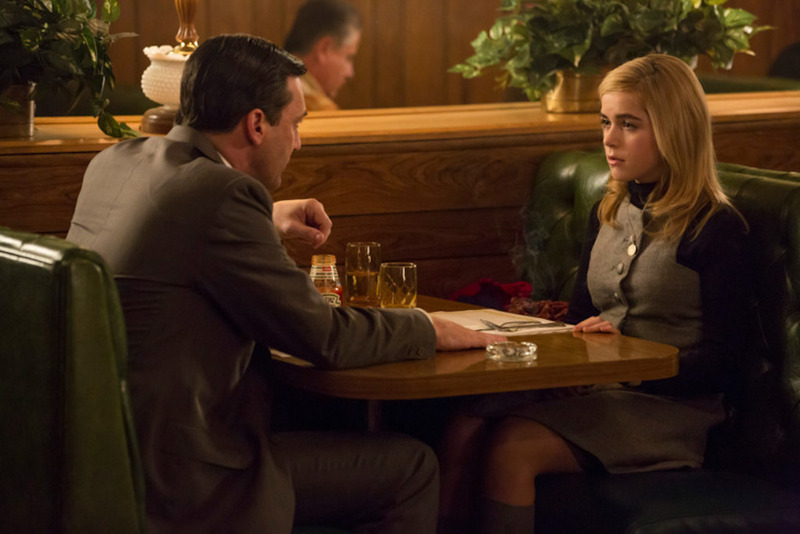 Her dress is almost the same color as Don’s suit, which sets up a nice parallel between the two characters. The way they’re sitting across from each other in this scene implies that Sally might grow up to be a lot like her father. I wonder what kind of person Sally would be in 2019. This is the shirt that launches a thousand conspiracy theories. After Megan was spotted wearing this t-shirt, eagle-eyed fans noticed that model Sharon Tate was once photographed in some very similar attire. Sadly, Sharon Tate was murdered when she was only 26 years old by members of Charles Manson’s “family.” Megan was living alone at this point in the series, and some viewers thought that she was destined to suffer the same fate as Sharon Tate. 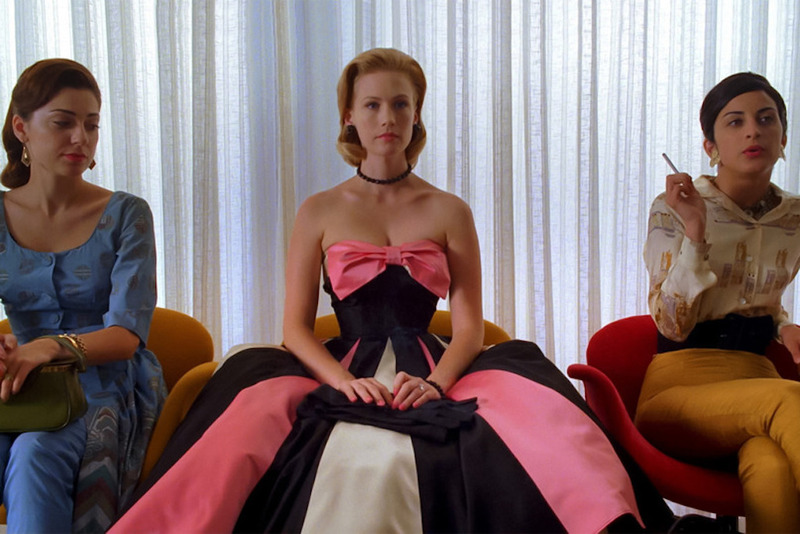 We’ve seen Betty Draper in many fancy outfits, but this shot of her in a party dress sitting on her bed is just the definition of disappointment. I’m not disappointed in the dress, I just think that if you looked up the word disappointment in the dictionary, you could find this shot of Betty right next to it. I love how the green polka dots on her dress match the headboard behind her, and how her hair is so perfectly disheveled. When Betty Draper thinks she’s going to get back into modeling, she wears this large crinoline-enhanced ballgown to a New York go-see. As you can clearly see in this shot, Betty looks nothing like the other women who’ve shown up to the audition. She’s much more old-fashioned and over the top. I can only imagine how uncomfortable Betty must have felt in this moment. I still think that dress is gorgeous on her, though. 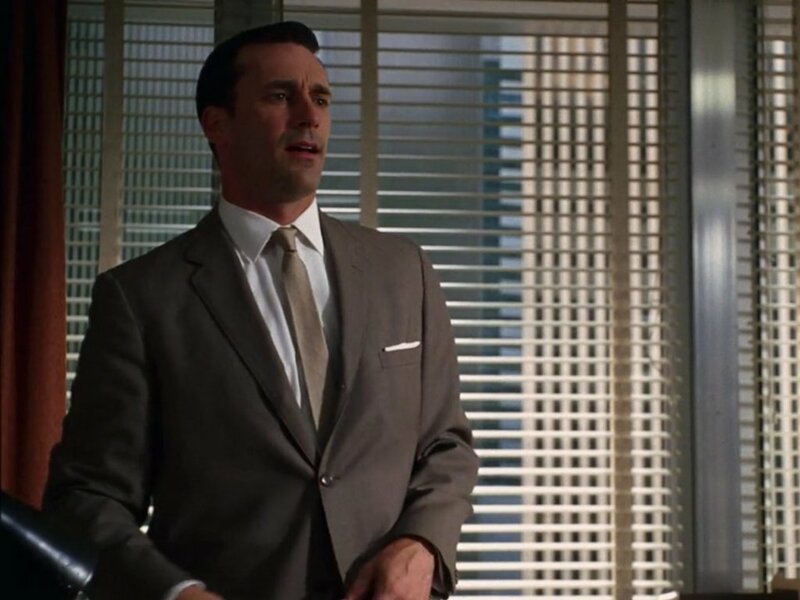 You’re probably used to seeing Don in a beautifully tailored solid colored suit. Well, that is definitely what he wears to work most days, but for a casual Saturday after-hours get together, Don’s chosen to wear something a little less formal. It’s a suit jacket, but it’s made for the weekend — Don isn’t exactly dressing down for casual Saturday events, he’s just adding some color. 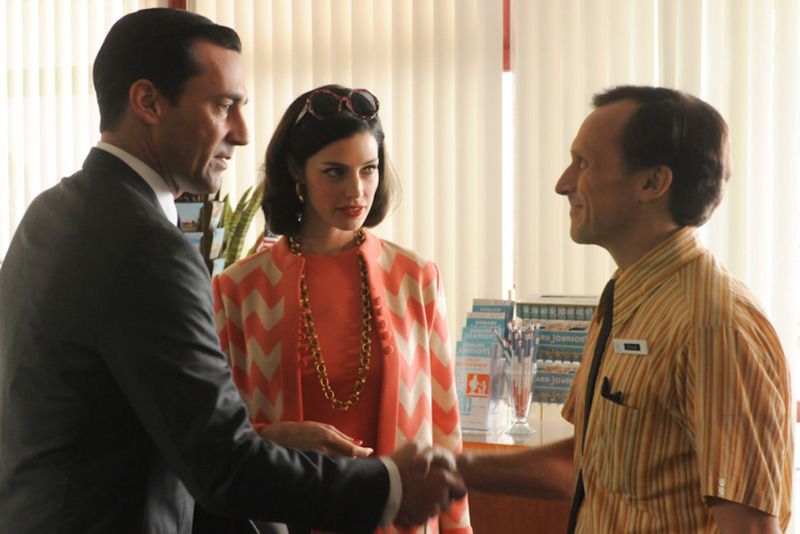 Season 5 Don knows how to shake things up. 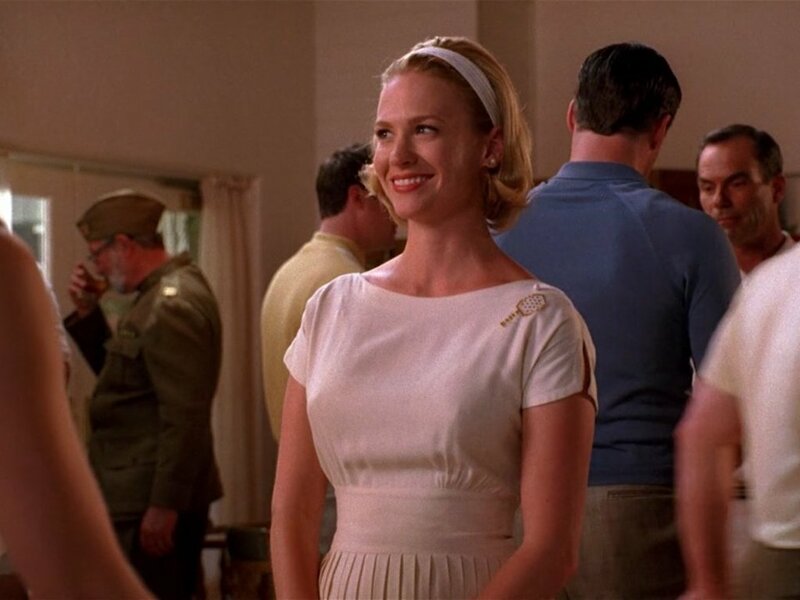 In Season 1, Betty accompanied Don to an award ceremony wearing this gorgeous white dress that almost looks like a wedding dress. 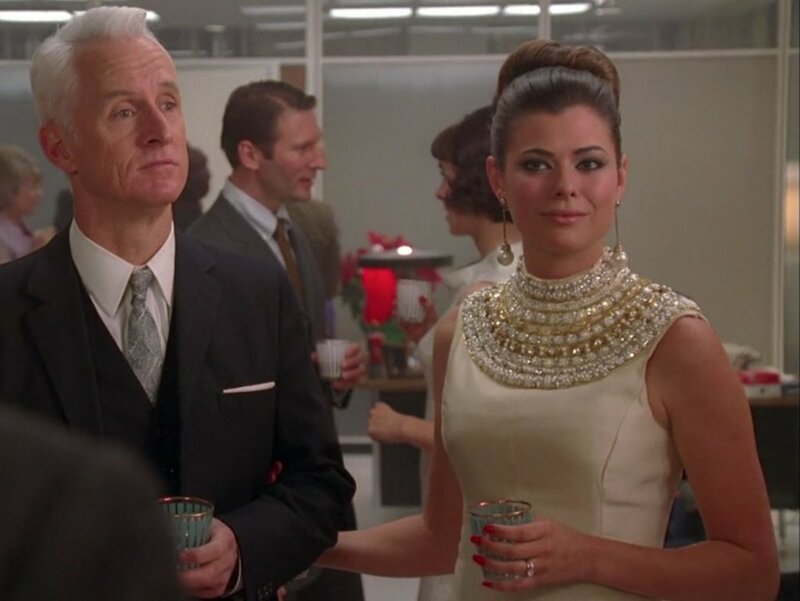 This dress tell us so much about Betty’s peronality— she’s pure, she’s put together, and she enjoys the finer things in life. This look is so classic— the statuesque cut, the glittery bodice, the jewelry, and the long white gloves. Her hair is a little bit looser at the end of the night, but she still looks like a queen. 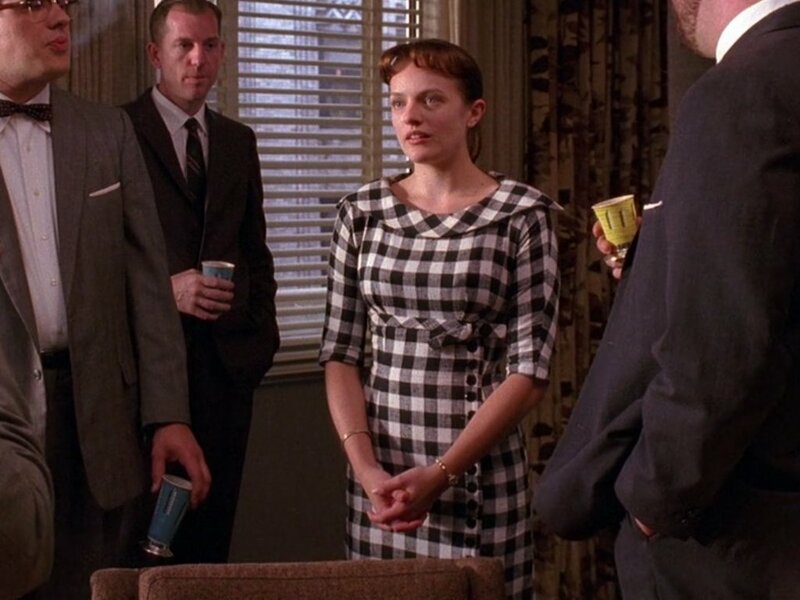 Until this moment in Season 6, we’d never seen Peggy in anything quite so masculine. 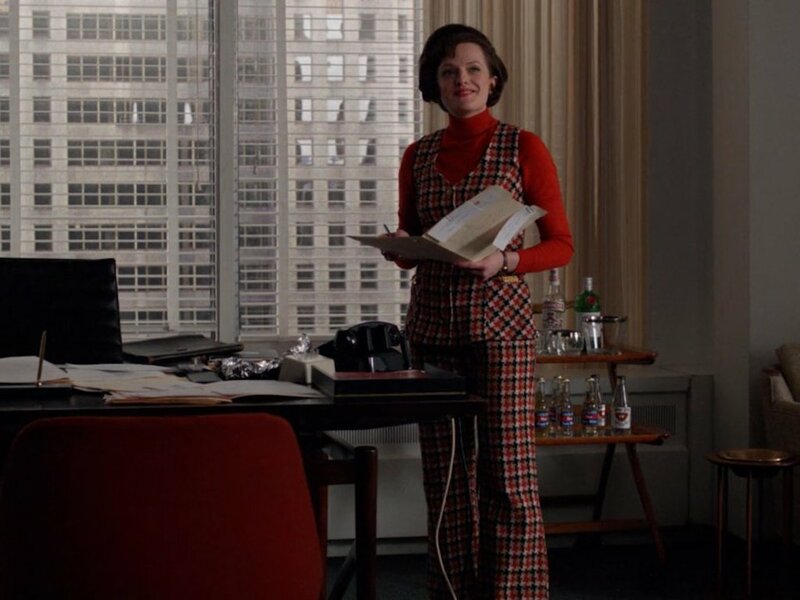 Her red and black checked pantsuit in Season 6 Episode 12 had everyone talking. 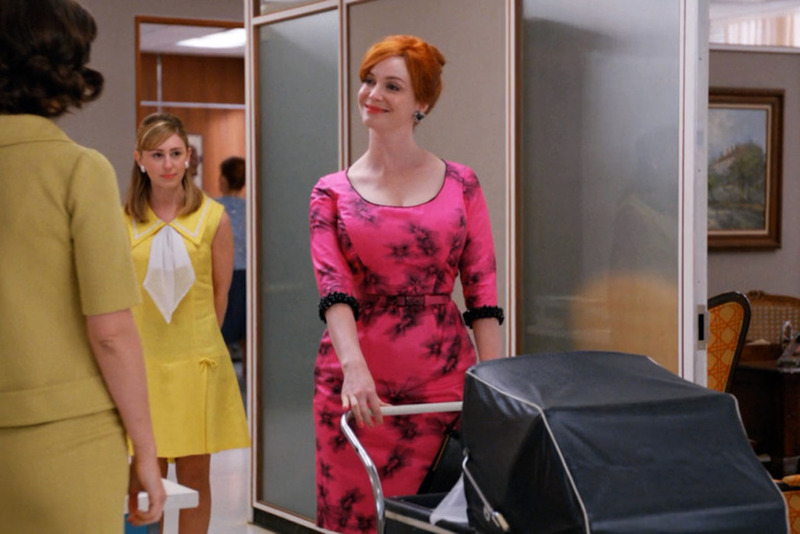 Peggy strictly wore skirts and dresses from seasons 1-5 of Mad Men. This pantsuit represents a final pull away from traditional femininity. 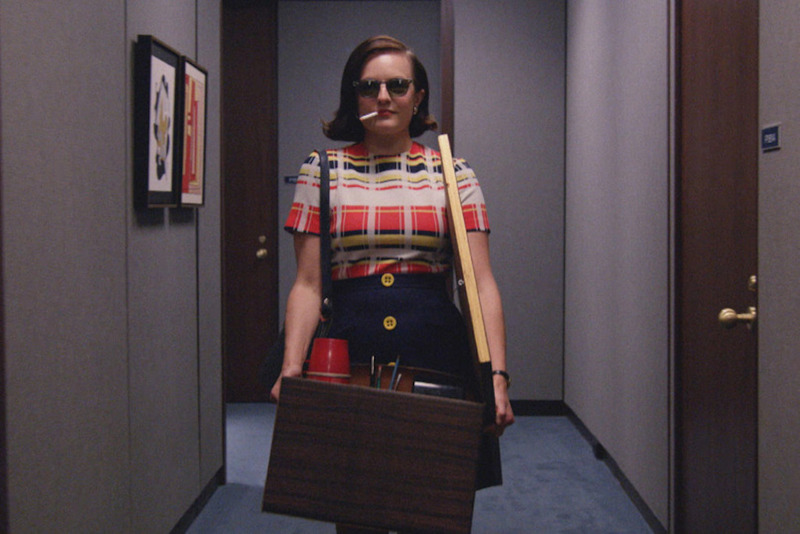 Peggy is a boss now, and she’s decided that it’s time to start dressing like one. Yeah, bosses can wear skirts now, but pants are so much more practical. Back in Season 4, Peggy wasn’t ready to wear that killer pantsuit, but she was starting to refine her look a little bit. This dress is a clear precursor to that tailored pantsuit. This simple dress with red pleats and a pearl necklace speaks volumes about how she’s moving up in the company and gaining self-confidence. She’s still got those pearls though, so she’s still holding on to classic femininity. In Season 3, Peggy was even more entrenched in outdated ideas about women in the workplace. By this point, Peggy was a fixture of the creative team. She was also at the beginning of a relationship with Duck. You can tell that her confidence is growing. She’s wearing bolder colors and taking more risks with her clothes. Check out her belted red sweater vest layered over this delicately printed silk blouse with a pleated skirt. 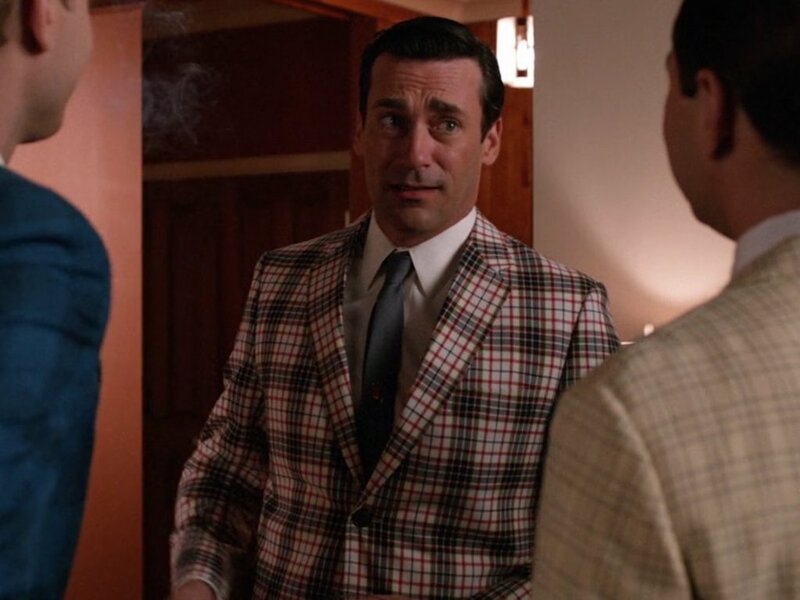 It would be wrong to discuss Mad Men fashion and not at least mention Don’s classic work look. It became his signature for a reason. This is what so many men wished they looked like in a suit. Don wore many versions of this outfit, but some elements were always the same— the narrow tie, crisp white shirt, and a full suit in any number of neutral colors. Men, please take note. 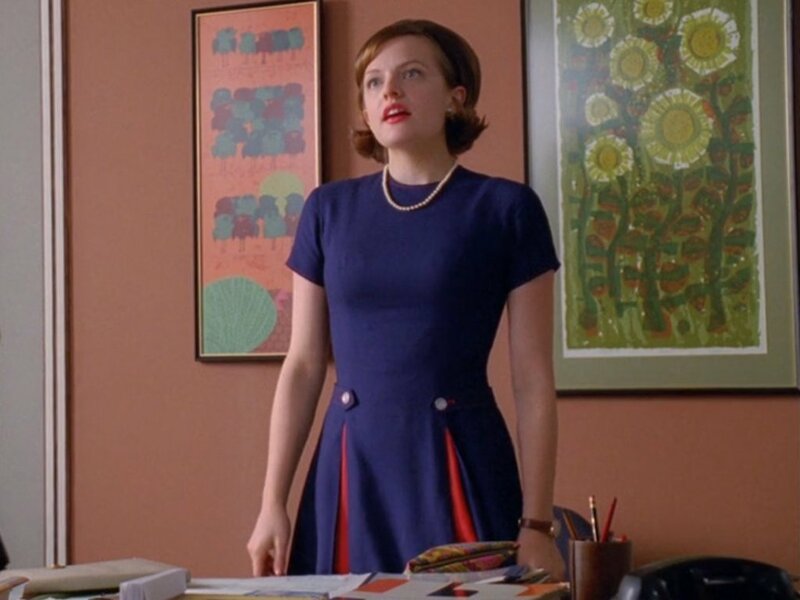 Back in Season 2, Peggy’s outfit choices were much more conservative. This was well before she was playing with bright colors, bold color blocking, or pantsuits for that matter. Her dresses were simple, colorless, and a little bit frumpy. This dress is a step in the right direction, though. It may not be as sleek as some of her later fashion choices, but at least she’s introducing a bold gingham pattern. The wide collar also adds some visual interest. Ok, now Peggy is really stepping up her fashion game. This shot is from the first episode of Season 4, and you can really see how Peggy’s personal growth is reflected in her clothes. 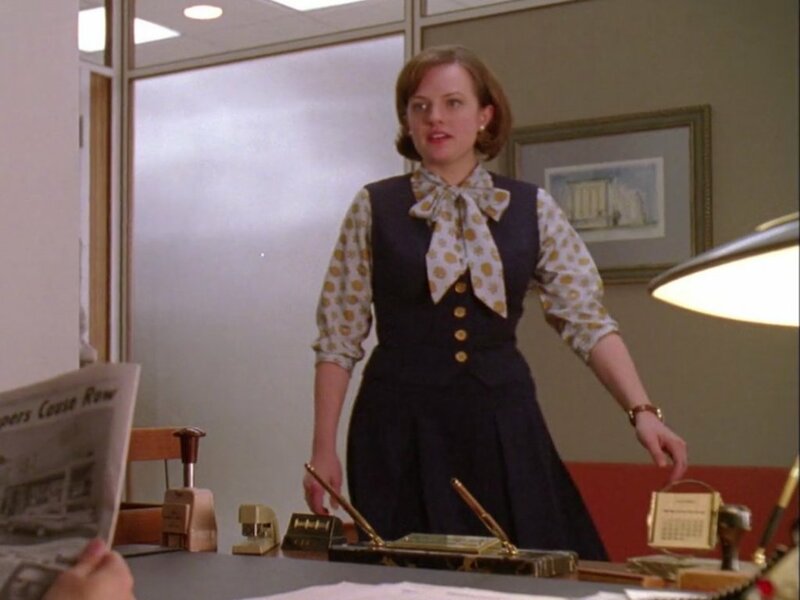 Peggy is finally dressing like the career woman she is. In this episode, she shows off some new, well-fitting pieces that feature more color, like this navy blue jumper dress layered over a polka-dot blouse with a big bow at the neck. Roger’s new wife, Jane, exposes her midriff in this very ’60s white, long-sleeved dress. It’s not just the dress that’s glamorous— check out her jewelry. Her earrings and her hair clips must have cost a fortune. Roger and Jane may have begun resenting each other already, but Jane’s clearly not resenting the money that comes with her new lifestyle. I bet she couldn’t afford to wear pearls in her hair before she married Roger. Jane seems to be fitting right in at the SCDP Christmas party. Everyone had a big fashion moment at this event, but Jane may have outdressed them all. Glamorous Lady Jane is wearing a fitted cream white dress with a big, Egyptian style sparkly collar, and dangly pearl earrings. This dress is perfect for a snowy winter evening in New York. Jane definitely looks like a trophy wife, which is probably exactly what she’s going for. 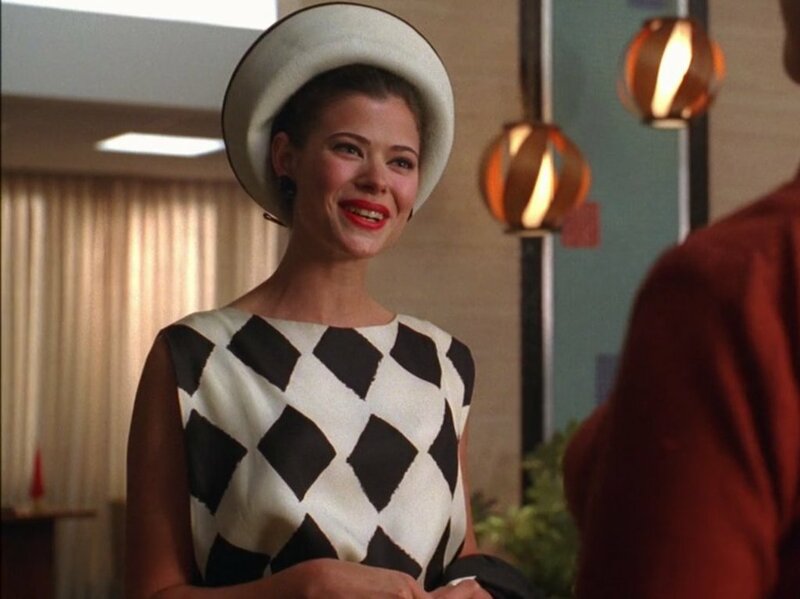 Jane’s work outfits were always pretty and flattering, but when she shows up at Sterling Cooper in Season 3, she outdresses every woman in the office in this black and white diamond dress and matching circular hat. This look does feel very French inspired, which is fitting because Roger later begins a relationship with Megan’s mother, Mrs. Calvet, who is French Canadian. He really does seem to like all things French. In Season 2, Betty goes to a country club wearing this white tennis outfit, complete with tennis racket embroidery. Do you think Betty actually plays tennis, though? Absolutely not. The white headband and pleated white dress is the perfect preppy look for her country club visit, but Betty isn’t going to get on the court any time soon. This look is all fashion and no function, although she does look darling in it. Trudy may be young, but she’s always dressed like old money. I mean, look at her white gloves, polka-dot suit and netted hat to hold her updo. Trudy’s style probably evolved the least over the seven seasons of the show. She got older, in the very last episode, she’s wearing a round hat that isn’t too dissimilar from this one. Yes, it’s fur, but it seems like Trudy is holding onto that round hat style for dear life. 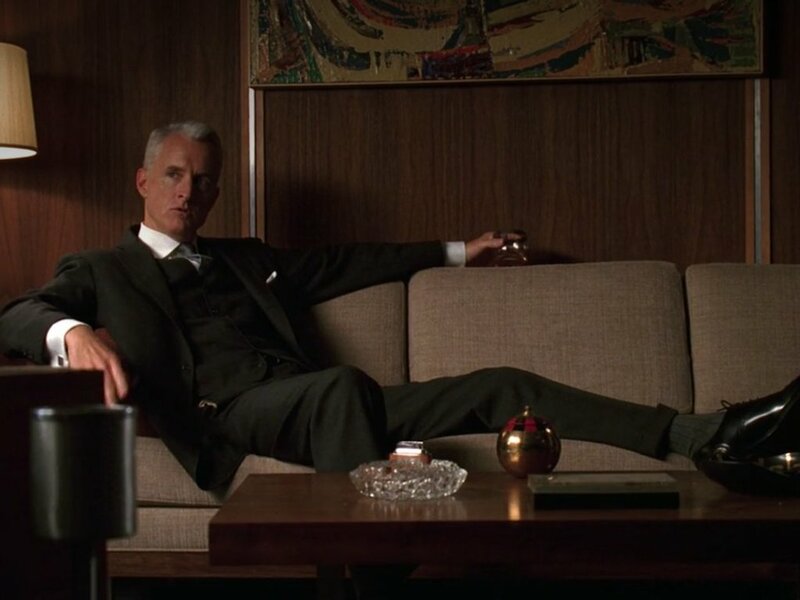 Don’t tell me you’re not impressed by this shot of Roger in a suit just lounging on a couch in the office. There’s something about a silver fox that just gets me every time. 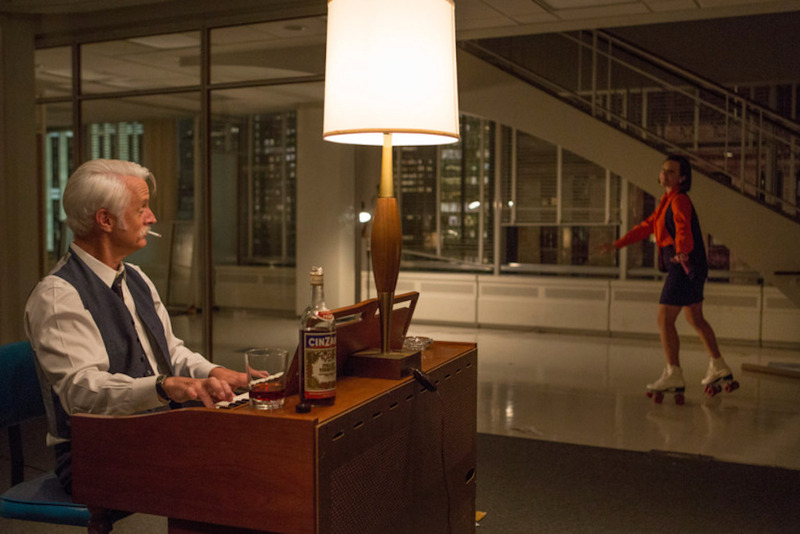 The head man-child of Sterling Cooper (Draper Pryce, etc.) rarely deviates from his go-to neat, dark-colored three-piece suit. You know what, why mess with a good thing? If it ‘aint broke, don’t fix it. Don’t ever change, Roger. Megan played Snow White in this commercial that she was able to book with Don’s help. This is Megan’s real first taste of fame and our first hint that she’s going to put her pursuit of fame over her relationship with Don. She does look absolutely lovely in this costume. I love how the bright reds and yellows in the dress play against her skin tone, and I need that flower crown in my life immediately. A skin-baring lifeguard outfit and an older crush were two big signs that Sally was growing up. As much as I love to see Kiernan Shipka maturing into a lovely young woman, it’s hard to lose that little girl version of Sally that we fell in love with in Season 1. I kind of get how Betty must have been feeling in this moment. It’s hard when it feel like time is moving past you at warp speed. Megan Draper wore this coral chevron-printed coat with a coordinating sheath dress to visit Howard Johnson’s in upstate New York. Unfortunately, the orange sherbet isn’t her thing, even though it matches her outfit. Suddenly the Drapers are in the middle of a dramatic fight which could signal the beginning of the end for Megan and Don. Megan’s sunglasses and jewelry definitely scream “weekend getaway.” Don doesn’t really look vacation ready. Nothing complements an office outfit better than a pair of roller skates. Peggy is moving on up and she doesn’t care who knows it. 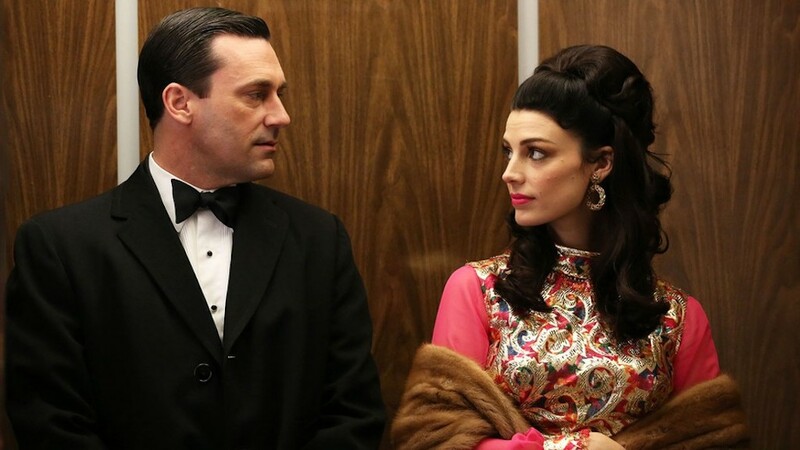 This is one of the best Mad Men episodes of all time. For most of the series, we didn’t really get to see Peggy and Roger interact with each other. In this moment, they are totally connected in the best way possible. Peggy looks like whatever the ’70s version of a skater girl is, and Roger has taken off one piece of his three-piece suit. Remember this? Peggy in her curly ponytail and Joan in a sleek solid colored dress? This is how they started, but they became so much more. In this scene, it is so clear that Joan has the upper hand. She’s dressed better, she looks more professional, and she’s literally standing above Peggy. Peggy looks like the new girl in town. She hasn’t quite figured out where she fits in yet. This is how I want to remember Peggy. 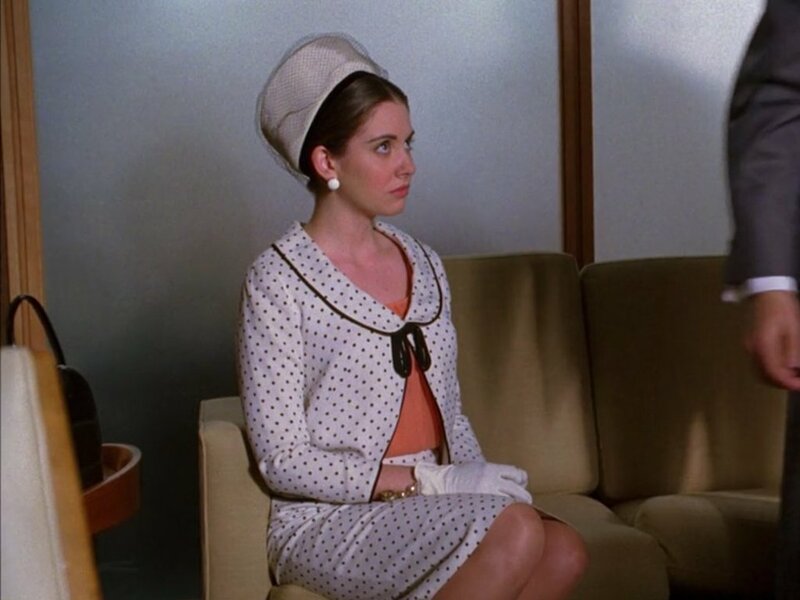 She’s come so far since she was a young and naive secretary back in Season 1. 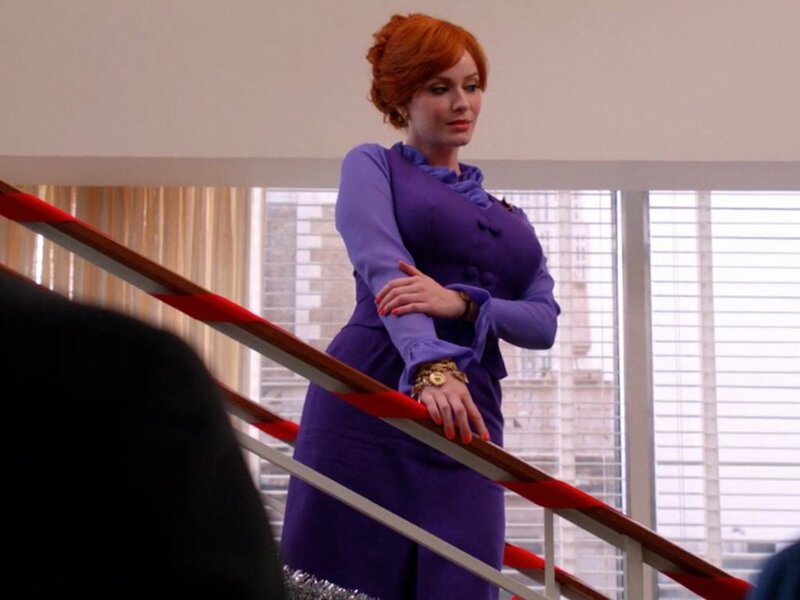 She never looked more on top of her game than when she moved into the McCann Erickson building in this outfit. This is the definition of modernity. Peggy is a woman on the move, and she’s not going to slow down for anybody. 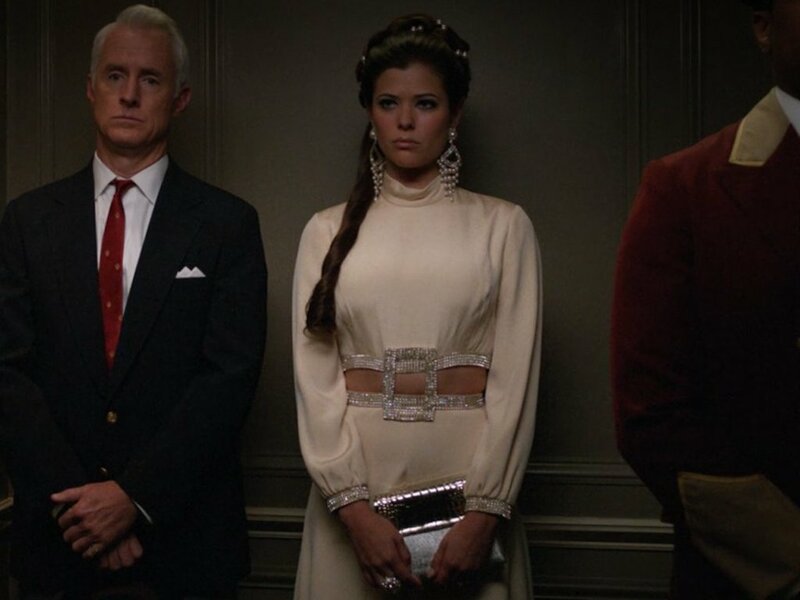 Mad Men had so many great fashion moments, but this one was the most meaningful for me.